Detached house for six people with a solid contemporary construction, bright and very comfortable, fully equipped, offers an easy and fascinating stay. Beautiful and nice out, but also beautiful and nice inside. On the ground floor: hall, spacious living room, bathroom, dining room and kitchen. Upstairs: distributor, three bedrooms, each with one pleasant and suggestive views and two complete bathrooms, one of them also with bathtub. Swiss, Italian and Spanish contemporary production furnishing and luminaires- DePadova, USM, Santa & Cole, Flos, Luceplan…- pieces of artist friends and antiques in perfect conditions. Possibility of providing an extra bed and chair for toddlers. -Bulthaup fully equipped kitchen : dishwasher, oven, microwave, refrigerator, small appliances, and all necessary kitchen utensils and crockery. Linen beds and towels are 100% cotton. Wifi. Tv with international channels reception. Stereo. Shading in summer and sunny in winter courtyard -the best room of the house. Small garden with fruit trees. Private garage and authorized access to downtown if needed. A great choice for your visit to Granada. Located in a small square of high Albaicín, its living core not touristy, yet Albaicín people, gypsies and old Granada people residence, more easily accessible and with all basic necessities two minutes away: pharmacy, supermarket, cafes and bars, four minutes from Casa pasteles,’Plaza Larga’ market, the international press kiosk. 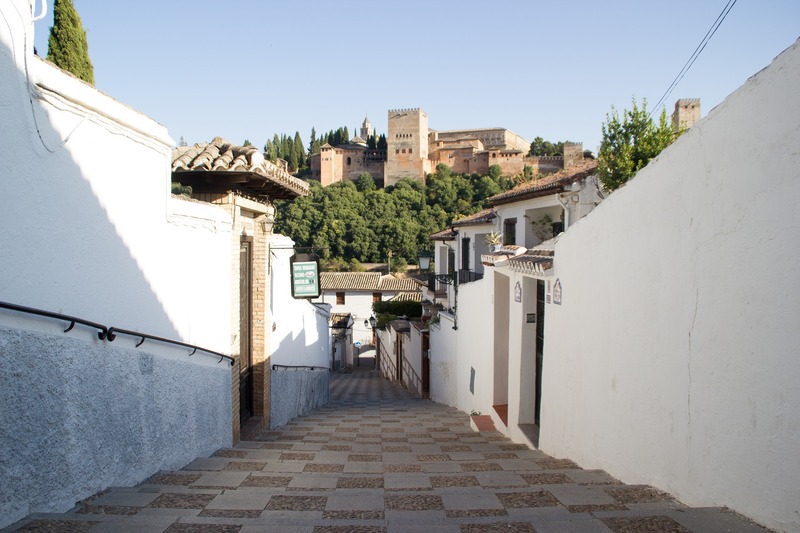 All required visits to Granada can be made giving a nice stroll, you can forget about the car for a few days. Within fifteen minutes walking we can decide between strolling in the quarter, with its bars, squares and viewpoints; the Alhambra and its surroundings; cultural visits to the classical, historic and commercial Granada; small nature tours along the paths of Sacromonte and the Generalife pasture leading into the Sierra Nevada Natural Park, hiking for all levels-very recommendable. Alhambra, Generalife and Albaicín, a World Heritage Site since 1984, and other lesser known monuments of great interest. In addition, various activities for each season in museums and cultural centers in the city: exhibitions, lectures, concert series which culminate with the International Festival of Music and Dance. Golf, tennis, biking, skiing, swimming, diving.